Um site de SEO elementos inspector e mapa do site gerador. 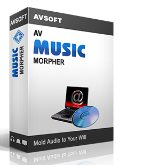 A luz e poderoso software de edição de áudio para qualquer tarefa de áudio. Este é um site de SEO elementos inspector e mapa do site gerador. Ele começa a verificar a partir da página inicial e passa por todas as páginas, uma por uma, até que ele verifica todas as páginas do site. Site rápido Inspetor inclui uma característica-rico de site da web de rastreador, que suporta diferentes tipos de autenticação de usuário, tais como certificado SSL e formulário de login. NB: A licença inclui 1 ano de atualizações e suporte. A cross-platform C++ development environment. I have downloaded installed and tested (on windows 7). The interface is a little old-fashioned but fairly intuitive to use. The crawl seemed quick enough - I tested locally on a 101 page website and it was less than a minute. 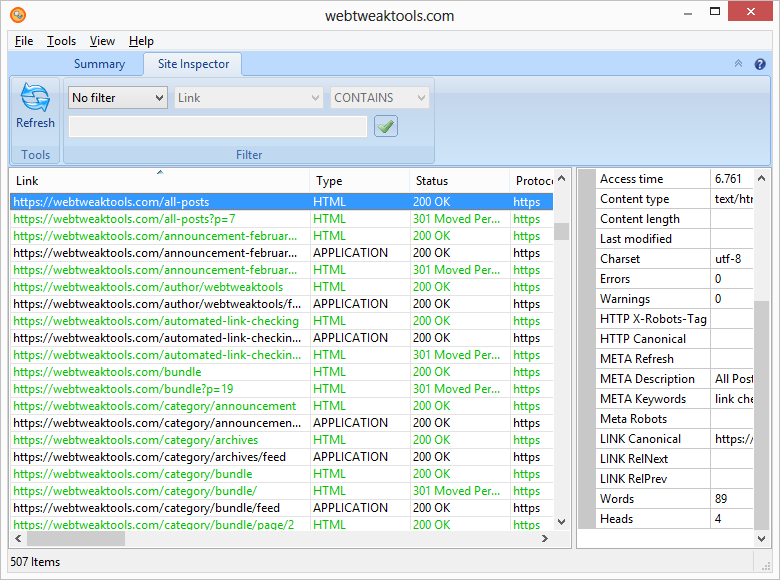 The view 'site inspector' screen gives a usable list of the info about each page. However the tool doesn't give any recommendations about the data, such as meta descriptions being too long, or the over or under use of heading tags. The 'view' showed some URLs as having 'warnings' / 'errors' but to see what they are you have to click on the row and then click on a button in the right panel. The way the heading tags are listed in the report is not very useful as each heading tag creates a new row in the report for the same page. To get a unique row for each URL, you have to choose to omit the head tag and head text from the report. It is very useful to be able to choose which rows to include when you create the report. For me the tool may be useful to get a quick listing of the tags / heading text etc, but I would in general prefer to use other tools which have more indepth reporting including SEO recommendations. I have downloaded installed and tested (on windows 7). The interface is a little old-fashioned but fairly intuitive to use. The crawl seemed quick enough - I tested locally on a 101 page website and it was less than a minute. 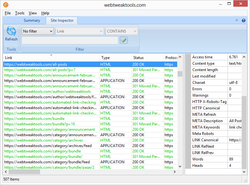 The view 'site inspector' screen gives a usable list of the info about each page. However the tool doesn't give any recommendations about the data, such as meta descriptions being too long, or the over or under use of heading tags. The onscreen 'view' and the 'report' are different and have different information. The view does not list heading tags text but the report does. Also the view lists all items including images, css , js etc, but the report only lists actual pages The 'view' showed some URLs as having 'warnings' / 'errors' but to see what they are you have to click on the row and then click on a button in the right panel. The way the heading tags are listed in the report is not very useful as each heading tag creates a new row in the report for the same page. To get a unique row for each URL, you have to choose to omit the head tag and head text from the report. It is very useful to be able to choose which rows to include when you create the report. There are some nice features in the crawler 'options' including being able to include / exclude specific URLs to crawl specified by wildcard. 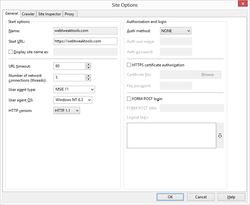 There is also an option to only include specific http response codes - e.g. 200 For me the tool may be useful to get a quick listing of the tags / heading text etc, but I would in general prefer to use other tools which have more indepth reporting including SEO recommendations. Could not scan my site and found only the startsite. 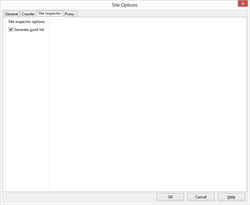 Wallner, "Could not scan my site and found only the startsite. The sitemap is a fancy" I'm not quite sure what you are getting at in your comment, could you please be good enough explain it for the sake of us old senile people. Thanks. Wallner, Usually this happens when your start page redirects to another site. 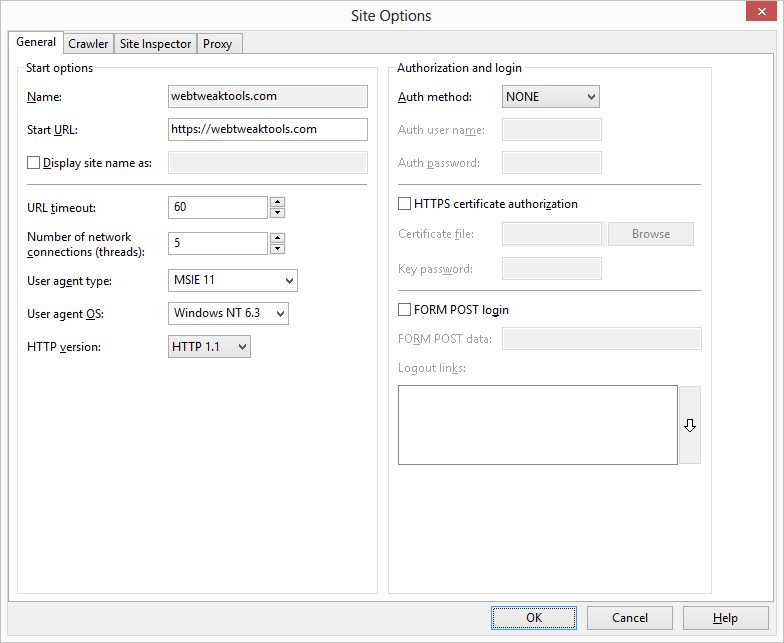 For example, if your start page is http and it redirects to https version of the same site, then it will not be followed because http and https sites are considered as different sites. I remember using tools like this one in the early days of static-web site building. Wow, I'm getting old since that happened some 20 years ago. Anyhow, then appeared dynamic web sites and those tools became almost useless. But, in the rare case you need one, will you pay 50 bucks? No way. Nowadays there are lots of free similar (unnecessary) tools for that purpose. I'll pass. Thanks for this useful tool, GOTD! It's a great starting point for repairing an old website like mine, especially for an amateur webmaster with intermediate skills who's still using outdated web publishing software (yep, Frontpage - be kind, guys! ), and keeping his life basic. Many Thanks! My PDF Doc é a solução de gerenciamento de tudo-em- um documento para iPhone, iPod touch e iPad.